When I started this website one of the things I wanted to do was feature a "Home Tour." Pictures of my home and little tips and tads about all the little design elements I have added over the years. But there was always a reason to put it off...I couldn't get the entire house clean in one day, I want to make a few more pillows for the couch, I need to refinish this or reupholster that, need to stage...blah, blah, blah. But then I realized that, like with everything, I don't have to do it ALL at once. After all, I have featured a few little tidbits here and there. So this is it...and as I manage to clean out and rearrange and refinish and reupholster, I will feature a little more when I can. After all, this house is in a constant ebb and flow...ever changing. That's just life. The upstairs? Where all the kids reside? Ummmm...like many bloggers there are just some places in our lives you probably won't see. Eventually, maybe. But right now there is just too much chaos up there...which is why all the kid's bedrooms are up there! I featured the flagstone project here! Last year I displayed a repurposed old wood window...I featured the wood windows here. This year I went with this awesome wall hanging I bought at an auction and repurposed. The tall iron planter is one I originally had in my master bedroom but moved out when I decided to "declutter" the room! It is perfect for seasonal arrangements. The little wood bench was something I picked up several years ago at a flea market in Bristol, Virginia. It is great for seasonal planters and fall pumpkins! The old repurposed light fixtures are a bit difficult to see in the picture but you can find the makeover here! I built the bookshelves while the house was under construction. As you can see from the design of the bookcases, my decor taste was definitely "traditional" then. But I love them all the same! The top is a great place for seasonal decorations...scarecrows and pumpkins in the fall and Santa and trees at Christmas! We use the bar most of the time so I have placed the table against the wall and out of the way. During the holidays we drag it out and pull in all the chairs. This is my newest dining room table. You can check out the ever revolving dining room table here. And this year I added a new vintage Drexel server...haven't settled on a paint color yet...waiting on inspiration! The under-counter lighting in the kitchen, featured here, is one of my favorite projects...you just can't imagine the different it makes in your kitchen!!! And so easy! The most recent kitchen makeover was revealed here...yes, it goes through a little transformation every couple of years! Check out the new microwave and stove here. You can check out the new dining room light fixture and bar makeover here. About a year after buying this house, I knocked out the back wall and added the bar, bookcases and the den. My boys were "pre-teens" and I thought I needed two living spaces!! Then they grow up and go away...and suddenly the space seems too large. Until they come home...and trust me, they DO come home. As you can see, this room is flooded with light...which is great except when it is 100 degrees out and the sun is blazing or when it is below zero and the wind is howling! But you will notice throughout my house...I am not a big fan of window dressings. I do the absolute minimum necessary for basic privacy! Since I don't hang out in this room in my undies, there are no window dressings! I began a den makeover in the Spring of 2015....you can read about the process here. A fireplace transformation and new wood flooring! So much more to come when time and budget allow! You can check out the club chair makeover here. Yes, the cats sit on the bar to eat. Don't worry...I sanitize it before we use it! You can read more about making and using decorative pillows here, here and here! The guest bath. This little room has had four makeovers in the last 14 years. I did update the wall decor a bit this year with some vintage paintings! And of course the vanity, fixtures and lighting have received a complete overhaul (here! )a few years ago. The cabinets were refinished with Java gel stain (tutorial link here) although it is hard to see them in this picture. Simple and clean. Over the years my master bathroom has received a few little makeovers…this is the latest! My office was originally my master bedroom. Thirteen years ago I decided to expand so I built a large master bedroom and turned this space into my home office. 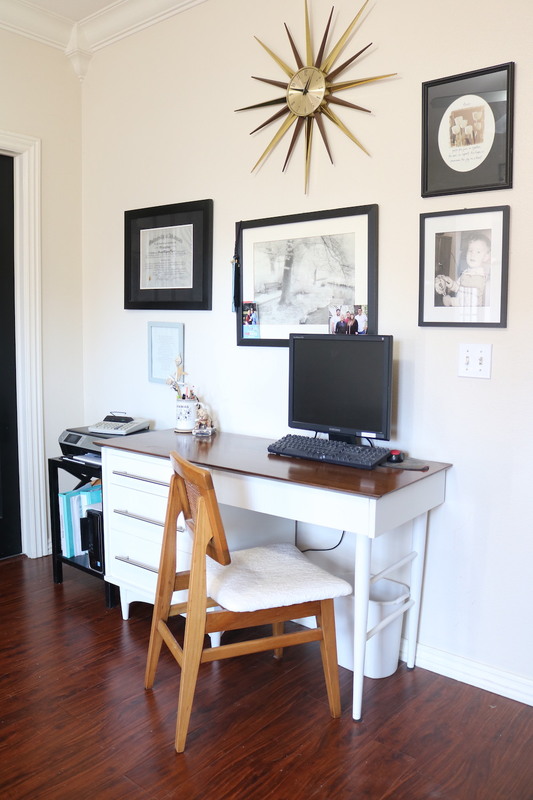 Over the years I have made a few changes...check out the before and afters and tutorials of the desk featured here, the dresser here and the wing back chair here. I love this room and I love all of the little design elements in it. 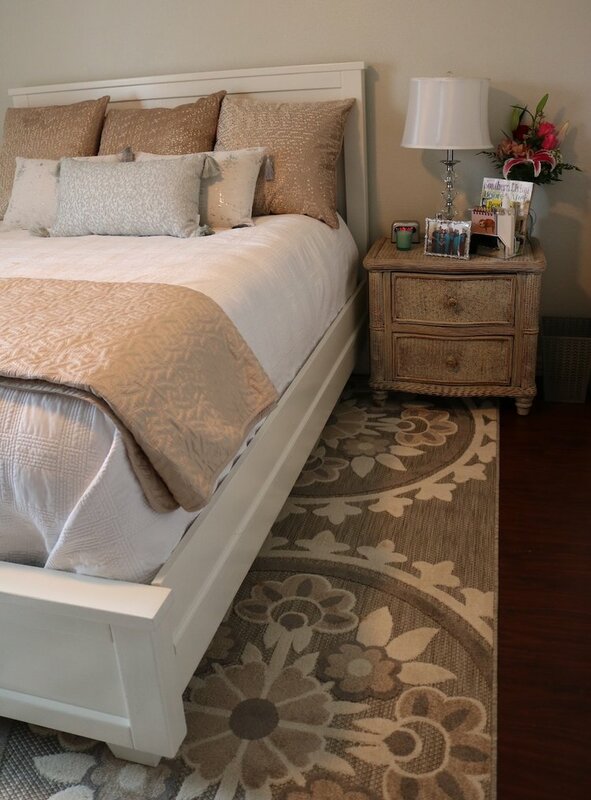 The only thing I would like to eventually add is a round, white furry rug...someday! I added this little chair this year! And the little stool. The master closet...it received a total makeover last year...the before and after and tutorial is featured here. My master bedroom. It is an awesome room, but one I really didn't do a lot with in the last 13 years...I just can't seem to find a "design style" I want in this room! I really crave "modern"...clean, simple, no froo-froo! Love the room...not so much the "decor." Maybe it is the furniture I spent too much money on. A few years ago I finally started chipping away at the room, one little "design element" at a time. I painted the furniture and you can see the transformation here ! And I FINALLY installed the laminate flooring! You can see that transformation here! The laundry room got a nice little makeover! You can check it out here! 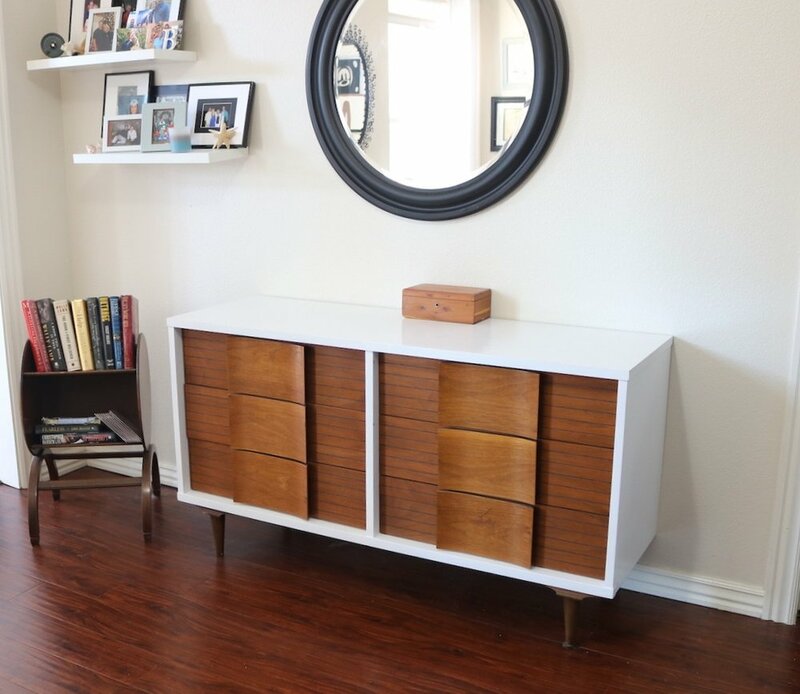 My favorite project in the room was the mid century dresser I refinished...you can read about that here. This year I finally finished my "proper guest room." And of course my yard...it is a space I feel is just as important as the inside! You can check out the "Yardscape" page for pictures of my yard in years past. We spend a great deal of time in the yard during the warmer months so I have worked hard to make it an extension of my home.